Ask any kid and they'll tell you: Accurately recreating violent videogames is hard work! 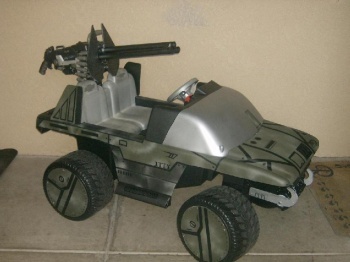 Luckily, one loving father took it upon himself to make Halo's Warthog a reality, at least for his tiny offspring. A devotee of the "Modified Power Wheels" dot com forums -- did you even know that was a thing? -- user "flux83" built the whole thing out of, well, honestly it's kind of complicated. There was a Power Wheels 2001 G3740 Street Scene Silverado involved at one point, but then he started chopping things apart and spraying Bondo everywhere, and ... if you're interesting in the details, have a look at the forum post where he explains it all. The end result is what we're all about, and the result of all this minor mechanical alteration is a vehicle that both looks a lot like Halo's most famous vehicle and functions as a car (assuming you're about three feet tall). I would have liked to have seen more modification on the turret (read: kids need to shoot stuff too), but otherwise expect your kids to read this and suddenly realize you are very much not the coolest father on the planet.